Swamp Thing #1 | Hey Adults! Comics! Swamp Thing was not what I was expecting. Of all the titles to reboot from the beginning of the character, I was sure this would be one. Instead, we get Alec Holland having already been Swamp Thing and having had his humanity restored with no memory of his time as Swamp Thing. We also get a guest appearance from a Superman who is well established as a hero, so very much later in the timeline. Swamp Thing is a strange enough character that I would have thought they’d want to start with some kind of origin tale, instead we get lots of hints of what’s happened and one of my favorite parts of the issue, Dr. Holland still has some kind of residual powers. It is revealed as his ability to tell if wood is at all rotted. The way it is shown, you might think it is all in his head, but the “thought balloons” imply that it isn’t. There’s a really creepy “evil” established in the issue, killing some archaeologists and taking possession of their bodies. It feels like it’ll tie into the Animal Man storyline with the “Hunters Three” antagonists, but I can’t be sure. At the end they show the Swamp Thing separate from Dr. Holland, perhaps about to rejoin with him, perhaps as an ally, perhaps as an adversary, there’s just not enough shown in the brief appearance at the end of the issue to know. Superman implies there’s some recent disaster associated with Swamp Thing which might or might not be connected to the pre-Flashpoint “Brightest Day” storyline. I hope it isn’t, I really hated that storyline. This hasn’t been a character I’ve ever really been interested in, the early comics were more of a horror comic than I tend to like and later they seemed to think being obtuse was the equivalent of being artistic. That impression could be entirely because I didn’t follow the character consistently and they had many writers that all seemed to want to go their own way. Strangely in a reboot, they may be trying to tie together all the major character developments from all the writers changes. I don’t think I’ll be sticking around to find out unless it turns out it is strongly linked to the Animal Man title, then again that might get me to dump Animal Man despite my love of Animal Man. 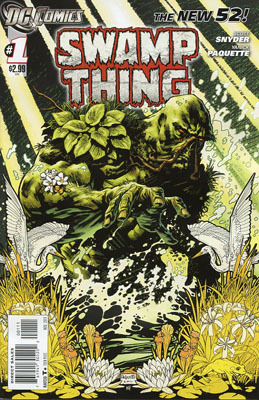 This entry was posted in Uncategorized and tagged Superman, Swamp Thing. Bookmark the permalink.